Better take an evening off for this one. Make it an evening where you don’t have work the next day. Take the kids to their grandmother – or buy them an X-Box. Have food prepared and coffee standing ready. Because this is a long one, especially the first few times you play. Sigismundus Augustus will never be a short game, or even a medium length game, but with some experience it does become a shorter game. Trust me on that one, do not say at 11 PM that you have this new game that you could quickly try out. Especially not, and I feel it worthy to repeat that, when you have work the next day. It is 1548 in the country of the Jagiellons. That’s not from The Lord of the Rings, by the way, the Jagiellons were rulers of Poland and Lithuania through a big part of the Middle Ages. And some neighbouring countries for part of that time. But I digress. Sorry, I get carried away when I look up stuff on Wikipedia. Sigismundus Augusts – Dei Gratia Rex Poloniae (that’s the full title) is set after the death of King Sigismund I of Poland, when his son Sigismund II Augustus takes the crown. The players represent noble families, members of the Sejm – that’s the Polish Parliament. (I already learned more about Polish history from this game than I did in school, and it’s a neighbouring country. Go figure.) Of course, that’s the perfect opportunity to improve your family’s standing over the next 21 years / 8 rounds that the game lasts. The King is in one of his moods. You’d think that pleasing the King is the best way to do that, but meeting the King’s Demand at the end of each round has a surprisingly indirect impact on your success, the King doesn’t shower you in Gold or Victory Points for pleasing him. It’s much more complex and challenging than that. And thus I present to you: Being successful in the Kingdom of Poland in Six Easy Steps (and Three Much Harder Steps). Each round starts with some basic setup and book-keeping: the start player passes on, everyone gets money, everyone draws cards. That last one is actually not quite so basic already, there are three types of Policy Cards (Military, Internal and Foreign) policy that you chose from, a decision that has a pretty big impact on your options later. After you took your one card – plus bonus cards you may have from various sources – you may play one of them. There are only four different actions in each type of Policy Card, so if you’re good at counting cards you have a pretty decent idea what your opponents can do. But quite often they do nothing in this phase because all cards have secondary uses later in the round. So much for the potatoes of the game: those steps are important for the whole thing to work, they round off the dish, but they’re not what you’re here for. That’s the next three phases, the meat of Sigismundus Augustus. First you get the Foreign Policy phase. Foreign relations are a very important part of the game, being a primary source of points. In this phase you may send representatives to the six neighbouring countries (Sweden, the Habsburg Empire, the Ottoman Empire, the two Grand Duchies Moscow and Lithuania and the Crimean Khanate – another thing I never knew existed until this game. It was ruled by descendants of Genghis Khan). Foreign Policy is a majority game: whoever sends the most representatives to a country will gain the bonus for that country in the form of extra cards, money or free artillery units – you just have to love those Swedes – at the end of the round.You only get to send one representative for free, but you may discard Foreign Policy cards in order to send more, and you still get the chance in the following Action phase as well. But Foreign Policy is also a very dynamic affair, as you will notice when you’re trying to score points from it. First, not all countries are worth any points at all in any given round. The Royal Representative, an office awarded to one player each round, picks one country that the king considers most important and that country will score points. Additional countries may score points if someone played a Diplomatic Mission card this round. Second, and much more volatile: you never know how many points the scoring countries will be worth at the end of the round: with every representative sent to a country, it swaps places upwards on the Foreign Policy track. Having an undisputable majority in one country may thus work against you because the other players can move it down on the track until it’s worth one measly point. Better to leave them some hope, so they will actually help you to keep your country high on the track, and then cement your position only at the of the Action phase. The Action Phase is plain and simple worker placement with no surprises attached. 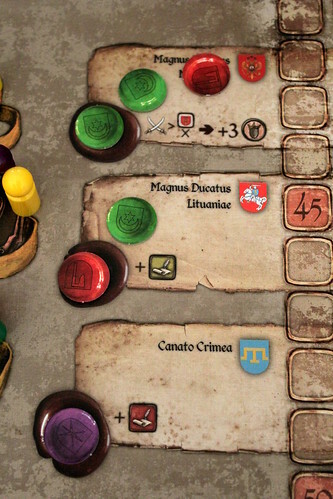 There are eight different actions, the first worker – called a Client in Sigismundus Augustus – on each is free, after that you pay one Ducat to the bank for each Client already present, including your own from previous turns. Towards the end of the Action phase, getting what you want becomes pretty damn expensive, so it’s perfectly reasonable that you have no way to permanently gain more Clients. You wouldn’t know where to put them. 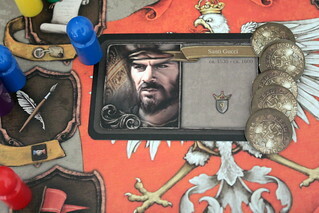 You may, however, gain a fourth Client for one round by playing the Client Policy Card or from being the Nobility’s Representative. The second option has the enormous added advantage that you place this extra client before anyone else. Given the steep costs of taking actions later, that’s pretty awesome. The actions are just like they should be in a good worker placement game: quick to execute, powerful, and all situational to a degree, there are no good or bad actions. Lets start where we ended the previous phase: the Envoy action sends another marker to a neighbouring country, just as in the Foreign Policy phase. The Economist gives you three Ducats. So does the Other Economist, but he’s only available when playing with five players. Calling Banners recruits a military unit, it doesn’t even cost anything – yet. At the Academy you draw two Policy Cards. Noble’s Feast and Parliamentary Agitation move your house marker forward on the respective Support Track. Being ahead here is good for you because you’ll have more votes in the next phase, being first also grants the aforementioned Nobility’s Representative card or the Magnate’s Representative who may play two action cards instead of one. You may also decide to become the Patron of a Historical Figure by taking the Figure card and setting a salary for it. Figures can grant all kinds of bonuses, again including bonus cards, bonus money and some other neat things. Many of them are simply worth points when the game ends, either a flat amount or based on the number of pretty much anything you can collect in the game. Word of advice: don’t be miserly on these people’s salary if you know what’s good for you. Another player taking the Patronage action can take them away from you by offering a higher salary, and there’s nothing you can do about it at that point. Finally, you can use the Vacancy action to mark an Office for auction in the next phase – we’ll see in a second why you might want to do that. When all the actions are done, the last long phase of the round is the Sejm Phase, a bit of a mixed bag where players make parliamentary decisions. To do that, you first gain votes. Your number of votes is based on your position on the three support tracks (Nobility’s, Magantes’ and Royal Support), you may gain extra votes for some Offices and by discarding Internal Policy cards. It’s important here to remember that the number of votes is limited to the 40 Vote Markers in the game, when they’re out they’re out – I guess getting 60 votes in a 40 seat parliament wasn’t something the King would accept easily. This may mean that the last players cannot discard cards for votes any more! No need to fret, though, as in any modern democracy you can try to buy more votes. Unlike in real life, complex negotiations and secrecy are not required, there is a simple blind auction system in place: first all players, simultaneously, decide how much they are willing to pay for votes. Then, again at the same time, they decide how much votes they would sell. The highest number of votes then goes to the highest bidder, and so on. At least the system is honest, no sinister backroom deals are taking place. When all the votes are sold the time comes to actually vote on something. That something are Offices, yet another type of cards that give their owner added income, some victory points and sometimes free Military Units. There is always at least one Office to vote for, but those are the boring rounds: the player with the most votes wins, done. It’s much more interesting when more Offices were marked to vote in the previous Action phase and players have to decide whether to put all their eggs in one basket or take a risk to win more offices. And then, finally, still in the Sejm phase, it’s time to please the King. Every round, he’ll demand one of three things: Military Support, Money or Votes. Whoever pledges the most wins first place on the Royal Support track, gaining five votes for the next round and the Royal Representative card. The Royal Representative may pick the country that will score points, not much to write home about. He also decides the winner in all draws. That’s a proper reason to support the king. The Royal Demand for the round is revealed when the round starts, and it brings a big change in everyone’s strategy: a round where the King wants money looks very different from one where he demands an army. 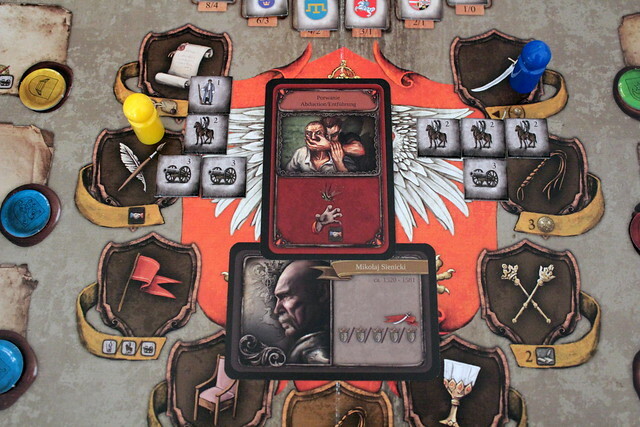 When His Majesty calls the armies, there is extra fun to be had: those armies are gone until this phase in the next round, and Sigismundus Augustus does have direct attacks on other players: the Military Policy Cards let you attack other players to steal their Money, Points or Employees. Victory in battle is based on the strength of your armies (and an annoying dice roll), so sending too many troops to support the King will leave you defenseless. And armies need to be fed, of course, so you don’t want too many of them hanging around, either. After that, all that’s left to do for the round is vote for the Law. And pay your armies, but that’s maintenance. The Law is the one bit of Sigismundus Augustus that I don’t really get: there are eight Law cards that are used in a fixed order, one per turn, and voted on by simple thumbs up or down from the players, not using vote markers. That leaves you no option to defend against a law that is disproportionately bad for you, your only option is to keep in mind all the laws that are still to come and act accordingly. For example, you don’t want to get all the Offices early in the game because one Law will force you to discard all but two of them, and if the other players have fewer, there is nothing you can do to protect yours. In a game that already has so many elements that all work together and make sense, this one makes me wonder why it is there. Update: we’ve been playing this phase wrong, your vote markers DO count for the Law vote. And I can’t even blame the rulebook, because it’s there plain and clear. That’s embarrassing for us, and we apologize for this mistake. Like that the Law vote makes much more sense. And since the Law to vote on is public knowledge from the start of the round, you know when you should save your markers. Plan accordingly! That dude. We want him. And all that is one round. You will play eight of those. Each action that you take is quick, but there is so much happening in each round that 20 minutes is the absolute minimum with four players, even if they all know the game. Later rounds will likely take a bit longer, so with four players you’re looking at a minimum of 160 minutes, round that up to three hours. Your first game will easily go to four – or you decide to play the quick game over four rounds first, but I found the second half of the game much more exciting. Sigismundus Augustus is a very long game. But the great thing is that it doesn’t feel long. After two hours I didn’t say “woah, this takes forever, lets do something else” but “woah, this was two hours already? Didn’t feel like it.” It never lets you wait long for your turn, because each individual action is very quick to do you rarely wait more than two minutes before it’s you again. And every action impacts the game, I don’t think I took any action just because I still had to do something. Everything is important, every decision is meaningful. I can’t think of many games that had so little filling between the important things. Given the game’s length, it’s exhausting, but with players that enjoy long, deep games it’s great. 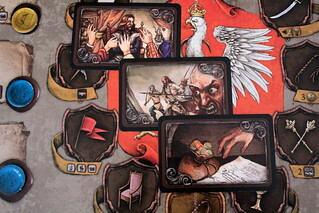 Another plus is that, although the three main phases employ very different mechanics in different areas of the board, they are not at all disconnected. What you do in one phase depends strongly on your actions or plans in the other phases. And finally, for a game that deals in politics but has no map or suchlike, Sigismundus Augusts looks very good. Board and box design both fit the theme of the game very well. My one big complaint about the components is the lack of proper player aids that explain the many different icons and effects on the board and the various cards. There are player aids printed on cards, but they are not very convenient and there are not enough for all players in any one language, so unless you’re playing with people that speak English, German and Polish you’re in trouble here. A player mat with everything on one page would have improved the experience especially for first-timers tremendously. 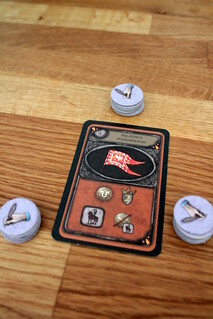 As it is, you should definitely find a player aid to print (like this one by BGG user Eric Teo) before your first game, it will make everything much smoother and you’ll be able to enjoy a great game instead of searching through a stack of player aid cards every turn. And for the love of god, do not play your first game one evening when you have work the next day!